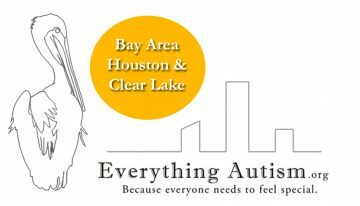 ﻿ Everything Autism | Serving those with Autism in Clear Lake and the Bay Area of Houston. more activities . . .
Why a “Family Fun” Guide? Everything Autism is about enjoying life with an autistic child—and the rest of your family, too. Certainly, everyone with special needs needs to feel special, but so do your other family members. “Because everyone needs to feel special,” our focus is on fun for the whole family, along with autism-specific resources and events for those living in the Bay Area of Houston. At Everything Autism.org, you can expect to find everything from the best area parks, day trips, low-cost vacation spots and entertainment for the whole family, from small up-close rodeos, horseback riding, and autism-friendly cruises, inclusive camps and child cares, and pediatric dentists and pediatricians good with special needs kids. Also information on local schools, alternative schools, homeschooling, and special programs and funding for college; and most importantly: information for parents to figure out where and how their special child might live when he/she grows up. It’s basically the resource I wished I had five years ago, when I was moving into the area, and hope others will help me to create. . . see more. Want to create a residential home in Clear Lake? EverythingAutism.org is looking for parents who want to make a difference in the greater Clear Lake Area. We are exploring after school care, summer care, residential housing, adult daycare, education, independent living, employment opportunities, and support for autistic adults who have outlived family/caretakers. We want to be EVERYTHING AUTISM for the Bay Area of Houston.